UN Secretary General Ban Ki-moon has urged nations to seize an "historic opportunity to revitalise agriculture" as a way of tackling the food crisis. Mr Ban told a UN-sponsored summit in Rome that food production would have to rise by 50% by 2030 to meet demand. Mr Ban said export restrictions and import tariffs ought to be minimised to alleviate the crisis. The summit comes as food costs have reached a 30-year high in real terms, causing riots in several countries. The host of the conference - the UN's Food and Agriculture Organisation (FAO) - has warned the industrialised countries that unless they increase yields, eliminate barriers and move food to where it is needed most, a global catastrophe could result. The FAO is calling for $1.7bn of emergency funding to tackle the shortage in production. The recent crisis is believed to have pushed 100 million people into hunger worldwide. Poorer countries are faced with a 40% increase in their food imports bill this year, and experts say some countries' food bills have doubled in the past year. 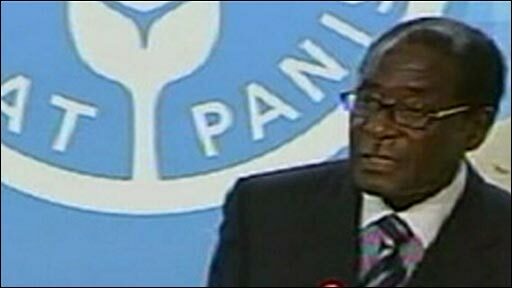 Zimbabwean President Robert Mugabe said the two key issues were "global warming and the use of agricultural commodities for the reproduction of biofuels"
Iranian President Mahmoud Ahmadinejad, a leading US critic, cited "certain powers" and "invisible hands" as trying "to control prices to achieve their political and economic aims"
Brazilian President Luis Inacio Lula da Silva defended his country's production of biofuels, saying that blaming ethanol production for food price rises was an "affront"
In his speech Mr Ban said the instability caused by the price rises threatened progress made in countries like Afghanistan, Liberia and Haiti. He talked of people in Liberia who used to buy rice by the bag and now bought it by the cup. The taskforce Mr Ban created to target the food crisis is expected to present a 38-page report with measures that could cost up to $15bn (£7.5bn) to implement. Announcing some of its findings, Mr Ban said high food prices offered a chance to finally address the ongoing problem of access to food for the world's poor. "The threats are obvious to us all. Yet this crisis also presents us with an opportunity," he said. "While we must respond immediately to high food prices, it is important that our longer term focus is on improving world food security," he said. Measures to improve access to food for vulnerable people include expanding aid, boosting smallholder production and minimising export restriction and import tariffs, he added. Mr Ban urged countries not to unilaterally intervene to control prices. "Some countries have taken action by limiting exports or by imposing price controls," he said. "As I have said before, I say again now: Beggar Thy Neighbour food policies cannot work. They only distort markets and force prices even higher." President Lula, meanwhile, denounced the "intolerable protectionism which stunts and disrupts" farming in developing countries. BBC World Debate: Food - Who Pays the Price?